MUMBAI — In Dharavi, a Mumbai slum, a ramshackle building houses the Bombay South Indian Adi-Dravida Sangh school, where 1,000 students from poor families take their classes in English, a language increasingly perceived as the key to a white-collar job. Tuition at the school is 400 rupees, or $6, a month, which represents about three days’ pay for the students’ parents, but they’d rather send their children here rather than to the free local public school because the quality of education is better. “We want our children to fare well, but we don’t have the capacity to put them in schools with very high fees,” said P. Ganesan, who stitches clothes at a garment factory nearby. However, this school is in danger of being shut down because of the Right to Education Act, introduced by the Indian government in 2009. The landmark legislation, which mandated free and compulsory education for all children from the ages of 6 and 14, ordered all schools to have infrastructure like a playground and separate toilets for boys, among other requirements, by March 31. Many education experts argue that the Right to Education Act, while lofty in its goals, does not pay attention to the ground realities of low-budget private schools. In a study of 15 budget private schools in New Delhi by the Center for Civil Society, it was found that to comply with the infrastructure requirements in the Right to Education Act, the schools would have to have an approximately four-fold increase in their fees, making them unaffordable for the section of society they currently serve. 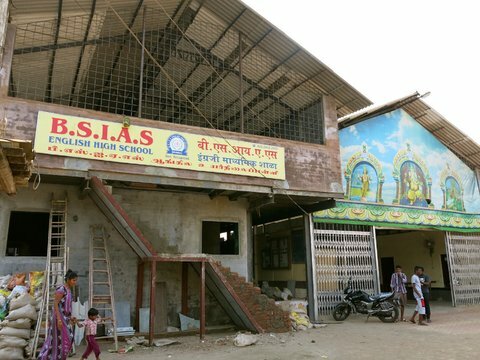 The Bombay South Indian Adi-Dravida Sangh School is undergoing some renovations, putting up concrete walls between classrooms and adding a second floor, but it doesn’t have the funds to make all the changes required by the Right to Education Act. “The R.T.E. regulations are good for students, but it is difficult to collect funds for the renovation because the fees are so low,” said Devraj Natarajan, treasurer of the board of trustees at Bombay South Indian Adi-Dravida Sangh School, referring to the legislation. Schools that fail to comply with infrastructure regulations, which are enforced by the state governments, risk being either shut down or being forced to pay a hefty fine. “There are nearly 300,000 budget private schools across the country with an estimated 15 million students, almost all of which will not be able to fulfill these norms,” said Shantanu Gupta, senior coordinator for advocacy at the Center for Civil Society. Though public schools generally have better infrastructure than the low-cost private schools, they have a higher level of teacher absenteeism than their private counterparts, and English is not usually the medium of instruction. A survey of rural schools across India by the nonprofit ASER Center, published in 2012, showed that basic skills like reading and math were better among children attending private schools compared to those at public schools. She added that one solution might be to move toward making it necessary for children to have access to resources like a playground, rather than insist that each school builds one. The critics of the Right to Education Act’s infrastructure requirements are not advocating that children take classes in unsafe conditions, but they say it is unfair to expect the schools to comply with the law in such a short period of time. Also, they point out, public schools that lack infrastructure will be subsidized by the government to make the necessary changes, while private schools will have to come up with the money on their own. As schools across the country start to be inspected by their state education departments, education authorities are worried that this will make schools more vulnerable to bribery attempts by government officials. The western state of Gujarat has taken a flexible approach in enforcing the Right to Education Act, offering a possible alternative for other states to adopt. As per the Gujarat state government’s rules, the efficacy of a school is measured as the weighted average of four parameters: 70 percent is given to absolute and relative levels of student learning outcomes, 15 percent is given to nonacademic outcomes like sports and 15 percent is given to school factors like facilities and teacher qualifications. While it remains unclear whether budget private schools that are not able to fulfill the infrastructure requirements will be allowed to remain open, the future of their students is uncertain. “A nice classroom and facilities are important, but here in Dharavi there is less space so we make the most of what there is,” said Faiyaz Ahmed, 14, a student at the Bombay South Indian Adi-Dravida Sangh School whose family moved to Dharavi from the northern state of Uttar Pradesh. He dreams of some day owning his own software company, like his idol, Narayana Murthy, the founder of the outsourcing giant Infosys. Faiyaz’s father is a mechanic and would like his son to take his studies further than he was able to. Published on January 4, 2014 in The New York Times India Ink.